Wismer, Maja. “One of Many: The Multiples of Joseph Beuys.” In Art Expanded, 1958-1978, edited by Eric Crosby with Liz Glass. Vol. 2 of Living Collections Catalogue. Minneapolis: Walker Art Center, 2015. http://walkerart.org/collections/publications/art-expanded/one-of-many-joseph-beuys. 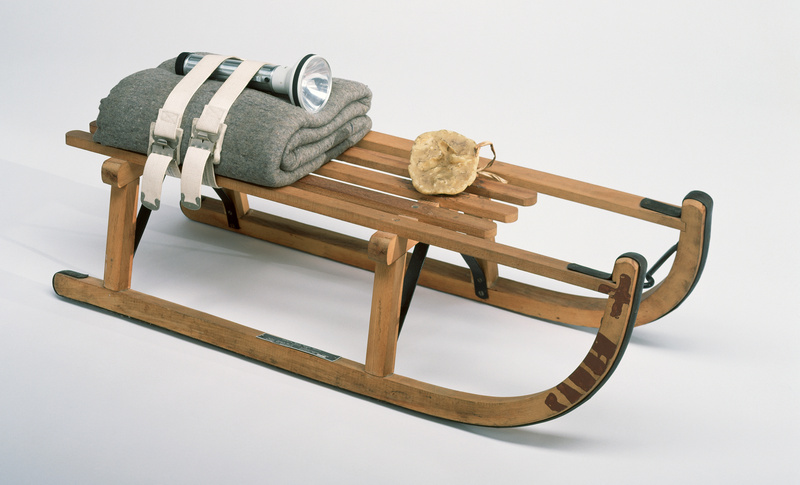 Joseph Beuys, Schlitten (Sled), 1969, wooden sled, felt, fabric straps, flashlight, fat, oil paint, string; ed. 48/50, 13 ¾ x 35 7/16 x 13 ¾ in. (34.9 x 90 x 34.9 cm). Alfred and Marie Greisinger Collection, Walker Art Center, T. B. Walker Acquisition Fund, 1992, 1992.218. 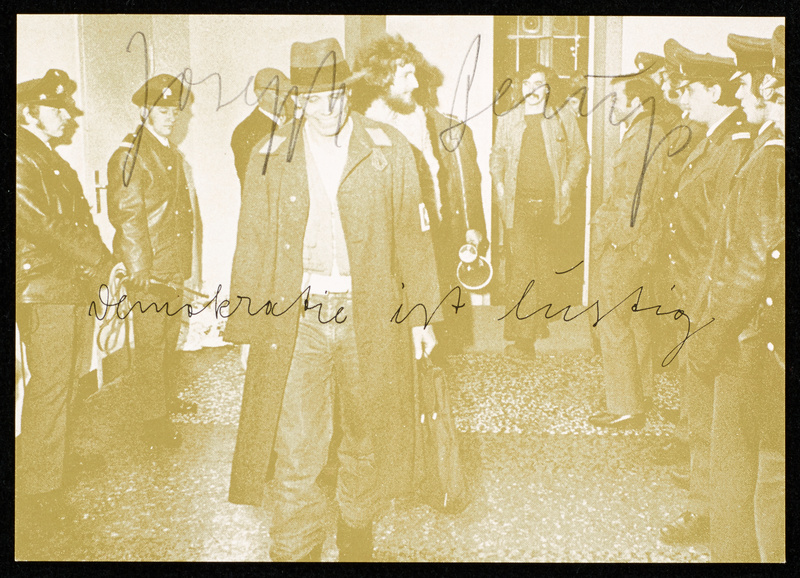 ©2015 Estate of Joseph Beuys/Artists Rights Society (ARS), New York. 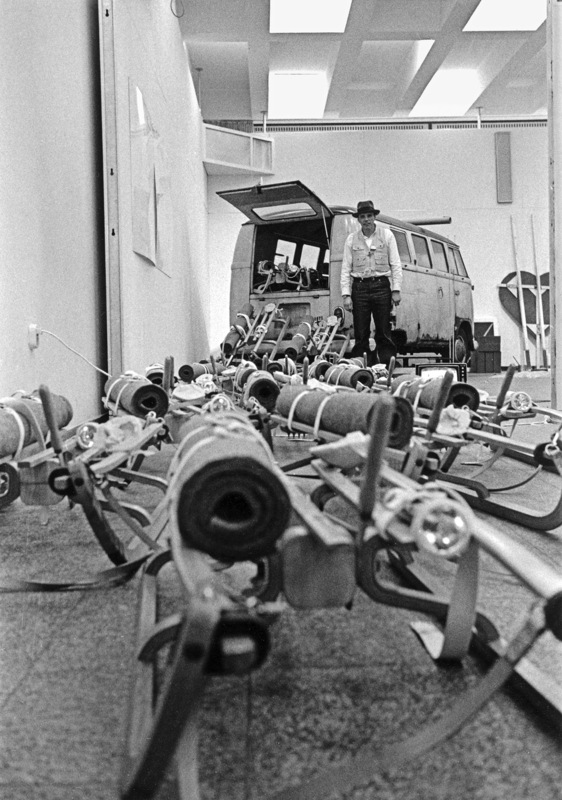 Joseph Beuys with his installation The Pack (das Rudel) at the 3rd Cologne Art Fair, Kunsthalle Cologne, 1969. Photo: Angelika Platen. bpk, Berlin/Art Resource, NY. Joseph Beuys, I The Chief, II How to Explain Paintings to a Dead Hare, 1970, offset lithograph on paper in exhibition catalogue Three towards infinity: new multiple art; edition of 4,000, 11 ¾ x 8 ¼ x ¼ in. (29.9 x 21 x 0.6 cm). Alfred and Marie Greisinger Collection, Walker Art Center, T. B. Walker Acquisition Fund, 1992, 1992.368. ©2015 Estate of Joseph Beuys/Artists Rights Society (ARS), New York. Beuys began conceiving of multiples around 1965, and by the 1970s, they had become a well-established category within his larger oeuvre. By 1986, the year of the artist’s death, he had created more than 550 multiple artworks and postcards.10 Aside from the countless multiples produced under the banner of Fluxus, Beuys’s consistent and prolific production of multiplied artworks is unique within the field of transatlantic, post–World War II art. Working at the time that the multiple emerged as a new category of art in the 1960s, Beuys challenged and extended the boundaries of the genre through his numerous contributions to the category. Not interested in art for art’s sake, he shaped the concept of the multiple into a flexible category that could accommodate various objects—works that didn’t belong to any other traditional genre or category of artistic activity. Not to be misunderstood as surplus or waste, Beuys’s multiples are closer to humus: the multiples materialize a variety of artistic gestures that exist discreetly as objects while also providing fodder to other projects, becoming elements that decompose or morph in and out of other forms across the totality of his artistic production. This working mode of elaborated “recycling” resonates with a short story originally published in Beuys’s 1964 text Vehicle Art, which centers on the “chief of the leader of the stags” in search of a recipe for a Kunstpille (art pill).11 While the stag hadn’t yet found the correct formula through his experimentation, the unintended byproducts of that work seemed promising. On the way to his ultimate goal—the self-contained Kunstpille—the stag accidentally produced Kunst zum Einreiben in Form von Salbe, which translates as “art to apply as ointment,” and Kunst in Wurstform zum Scheibenabschneiden, or “art as sliceable sausage.” While they did not reflect the stag’s original intention, these unintended inventions reassured him that he should continue his endeavor. As an open and continuously growing body of work (the results of which hardly ever paid off in economic terms), Beuys’s multiples—his “ointment” and “sausage”—yielded an inverted manifestation of process and labor distinct from his otherwise elaborate installations and performances, opening up new approaches and lines of thought for his continuing exploration. Other than incorporating Beuys’s attribution, mark, or appearance, his manifold multiples share no cohesive style; a unifying aesthetic is absent even though his recurring handwritten signature and iconic stamps unmistakably profess his authorship. 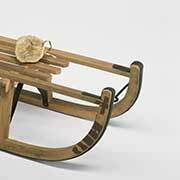 While Sled is significant for its popularity, becoming a notable and even iconic example of a Beuys multiple, it can also be read as symbolic of various ideas that the artist pursued throughout his career. As a sculptural object with clear reference to the installation The Pack, Sled acts as a metaphor for the distribution of Beuys’s ideas through the (here, quite literal) vehicle of a multiplied form. 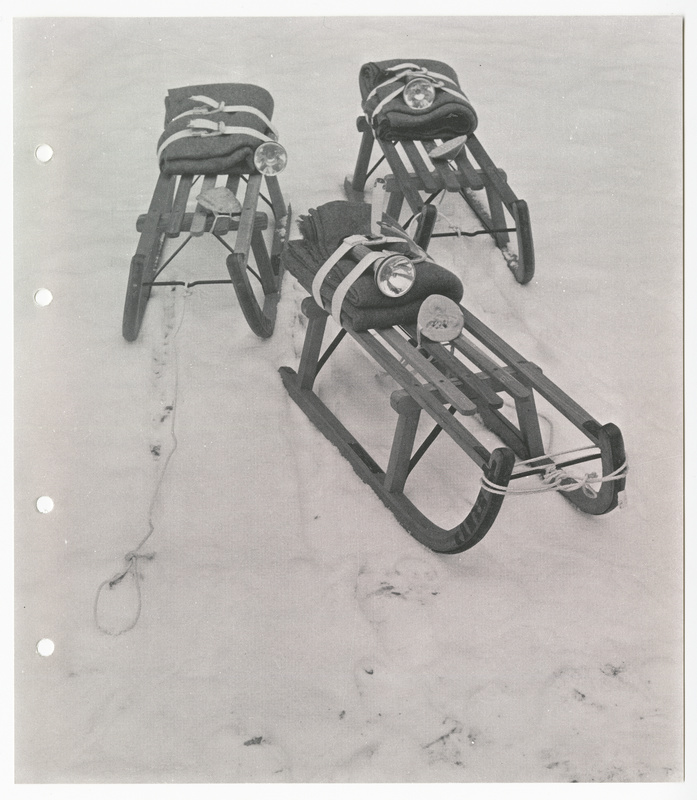 It is also mirrored in the different types of sleds that reappear as iconographic motifs within Beuys’s visual vocabulary. Featured in a number of early drawings, the sled can be read as a signifier for transition and movement, facilitating an imaginary reconnection with processes of metamorphosis in nature or the nomadic movement of archaic peoples.12 Both Sled and The Pack can also be interpreted as illustrations of the infamous and often retold story of the artist’s rescue after his plane crash on the Crimean Peninsula in 1944.13 While the narrative may contain more fiction than fact, it has nonetheless become an important part of the artist’s self-made mythology. 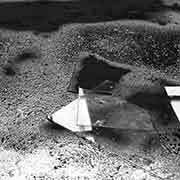 As the story goes, Beuys was in a plane crash while serving in the German Air Force during World War II. Discovered by Tatars, he was pulled through the snow on a sled and taken in by the benevolent nomads.14 The materials they used to wrap his injured body—fat and felt—would later become prominent substances in the artist’s sculptural works. Sled can therefore be read to fulfill three distinct roles: first, to serve as a representation of Beuys’s larger framework of references and personal mythologies; secondly, to function as an example of the multiple form that aligns, more or less, with the definitions of the genre; and, finally, to epitomize his desire to use the multiple as means to distribute ideas. Read within an examination of Beuys’s use of the multiple over the years, Sled becomes an almost self-contained formula for understanding his approach to the multiple form. Various artists, Flux Year Box 2, 1967, mixed media, 3 ⅜ x 8 x 8 ⅜ in. 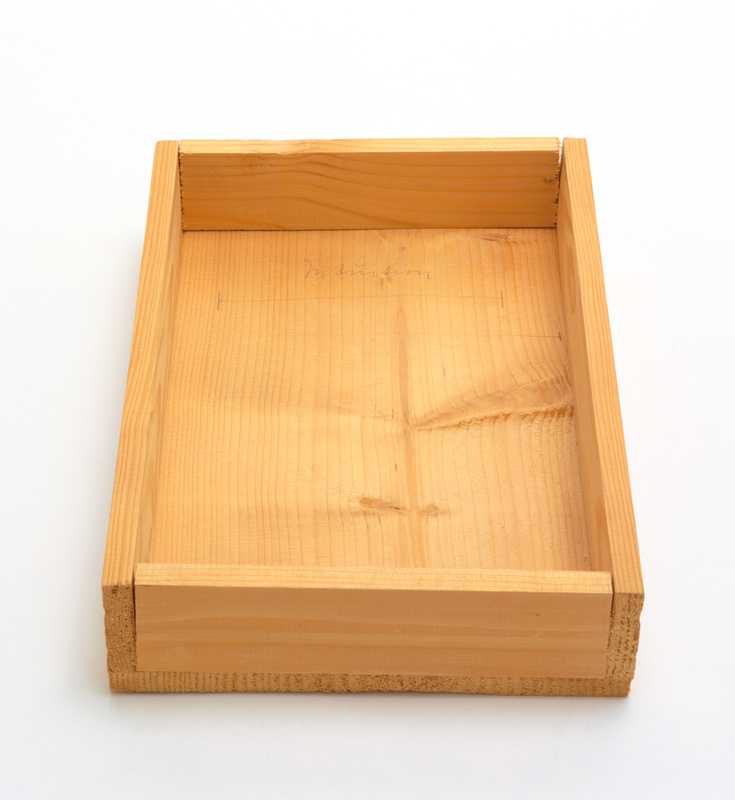 (8.6 x 20.3x 21.3 cm) box. Collection Walker Art Center, McKnight Acquisition Fund, 1999, 1999.50.1-.63. George Maciunas, FluxShop/FluxOrchestra, 1965, offset lithograph on paper, 20 15/16 x 6 11/16 in. (53.2 x 17 cm). Collection Walker Art Center, Walker Special Purchase Fund, 1989, 1989.140. The introduction of Edition MAT, combined with a frequent presence of Fluxus artists in the Rhineland, made the form well known among progressive artists in West Germany.19 Multiples and prints by US Pop artists were brought to Germany by Galerie Ricke of Kassel (and later Cologne) beginning in 1965, further solidifying the concept of the Auflagenobjekt (editioned object) in the minds of German artists.20 Widely obtainable and increasingly visible—whether entering institutional contexts via thematic exhibitions, shown in department store displays, or made available at specialized fairs—these artworks in multiple form opened the art world to a new breed of participant-collectors.21 The size, cost, and relative mobility of such objects had a broad international impact and the multiple proved able to influence existing art-world power structures, both in the United States and Western Europe. Block remembers that Beuys was resistant to the idea of multiplication at first; like Heubach, the artist had no interest in producing pleasing collectibles.26 Beuys’s installations and performative works of the 1960s had allowed him the freedom to introduce new, “non-art” materials such as fat or felt into his sculptural works. From this exploration of unconventional materials, he began stretching the definitions and limits of genres, developing what he referred to as his Plastische Theorie (“Theory of Sculpture”).27 At the core of Beuys’s approach to sculpture lay a contrast between rigid, geometric forms—which he described as “crystalline”—and softer, more organic entities. He was focused on making specific material choices, selecting changeable elements and substances that could be catalyzed into different states of being. Beuys’s interest in these transformative “evolutionary forces” for example, warmth, which could morph a crystalline form into a softer shape—pervaded his approach to both sculpture and other forms of expression. Emphasizing mutability and mobility over such qualities as structure and singularity, Beuys applied this theoretical framework to perceptive processes as well as forms of communication. His “Theory of Sculpture” hence provided a model for the artist to develop a broad interpretation of creation as a dynamic process. While there is not one final definition for this theory, Beuys employed it to describe his wish to expand the understanding of creative acts beyond their traditional application within the field of the arts.28 In light of such an extension of the concept of art, it is evident that there was little appeal for the artist to work within the restraints of multiples (or any other statically-defined category) as a formal genre. 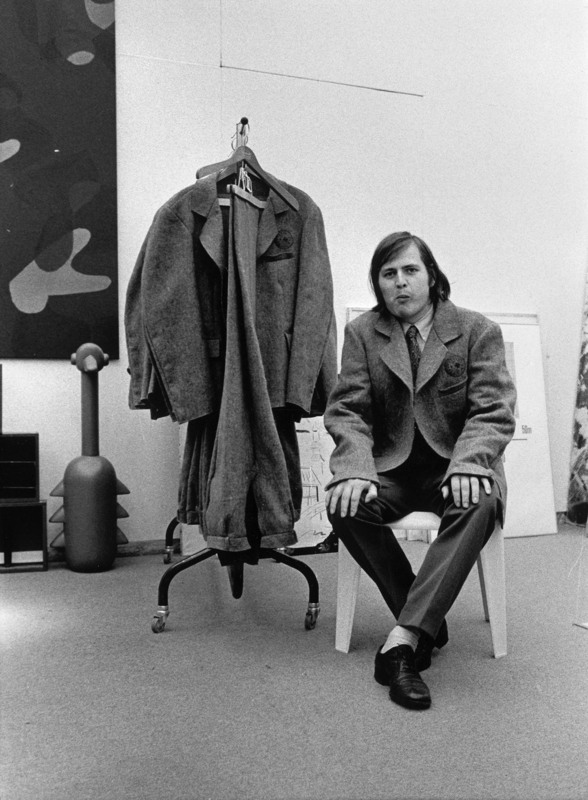 Gallerist and curator René Block with Joseph Beuy’s Fitzanzug (Felt Suit) at the 4th Cologne Art Fair, Josef-Haubrich Kunsthalle, 1970. Photo: Angelika Platen. bpk, Berlin/Art Resource, NY. 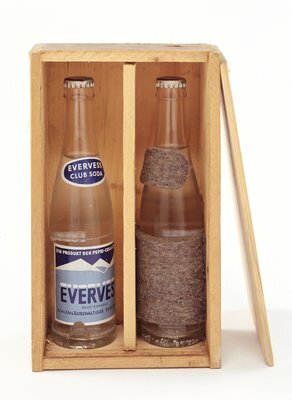 Joseph Beuys, Evervess II 1, two glass bottles of water, felt, printed wooden box, metal; edition of 40, 3 ⅝ x 6 ½ x 10 ⅞ (9.2 x 16.5 x 27.7 cm) box. Alfred and Marie Greisinger Collection, Walker Art Center, T. B. Walker Acquisition Fund, 1992, 1992.239.1-.4. ©2015 Estate of Joseph Beuys/Artists Rights Society (ARS), New York. Joseph Beuys, documenta 4, offset lithograph on paper, ink stamp; unnumbered edition, 4 ⅛ x 5 ⅞ in. (10.5 x 15 cm). Alfred and Marie Greisinger Collection, Walker Art Center, T. B. Walker Acquisition Fund, 1992, 1992.311. ©2015 Estate of Joseph Beuys/Artists Rights Society (ARS), New York. 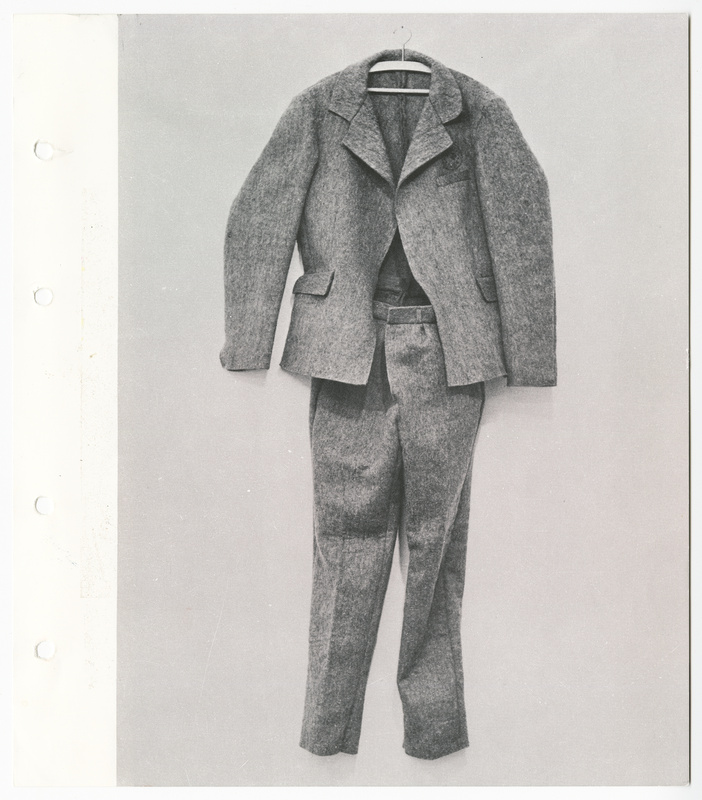 Joseph Beuys, Fitzanzug (Felt Suit), 1970, sewn felt, ink stamp; ed. 27/100, 69 x 49 ½ x 7 in. (127.3 x 125.7 x 17.8 cm) overall installed. Collection Walker Art Center, Walker Special Purchase Fund, 1987, 1987.121.1-.3. ©2015 Estate of Joseph Beuys/Artists Rights Society (ARS), New York. Beuys drew inspiration from others producing multiples as well, folding their ideas into his growing engagement with the form. Working under the auspices of his Interfunktionen publication, Friedrich W. Heubach offered Beuys another model for producing multiplied art. Heubach’s artist commissions were integrated into special editions of the publication, becoming both discreet works of art and a means of funding the magazine. Heubach’s approach emphasized printed matter over the production of loose objects. Embedded in the context of a magazine, the works produced under Heubach’s imprint veered away from the craft-oriented genre of “artist prints” and toward more commercial publication. 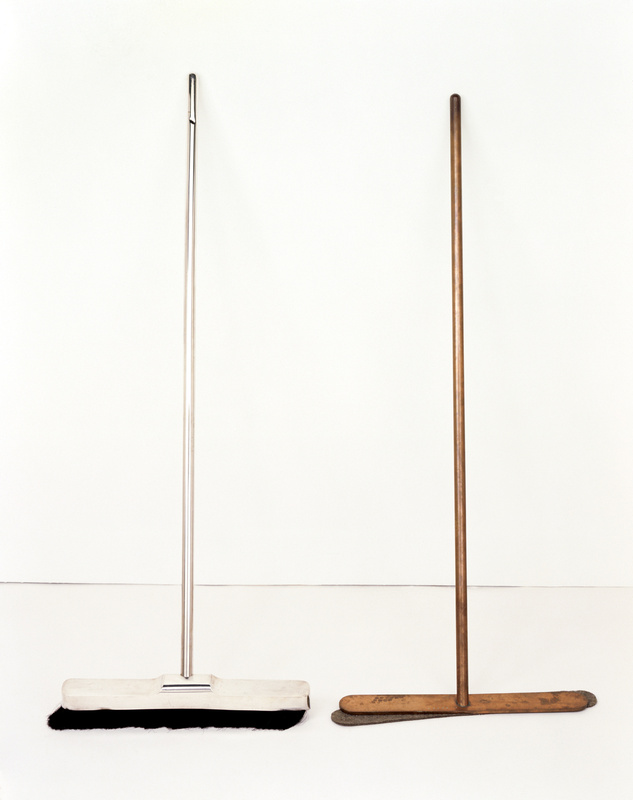 Joseph Beuys, Silberbesen und Besen ohne Haare (Silver Broom and Broom without Bristles), 1972, wooden broom with silver casing, copper, felt; ed. 8/20, 55 ½ x 20 x 2 in. (141 x 50.8 x 5.1 cm) assembled silver broom; 52 x 20 ½ x 2 ½ in. (132.1 x 52.1 x 6.4 cm) copper broom. Alfred and Marie Greisinger Collection, Walker Art Center, T. B. Walker Acquisition Fund, 1992, 1992.494.1-.4. ©2015 Estate of Joseph Beuys/Artists Rights Society (ARS), New York. Joseph Beuys, in interfunktionen 4, 1970, offset lithograph paper, ink stamps on paper, typewriting on paper collage, elastic bandage in the periodical interfunktionen no. 4; ed. 60/60, 8 ⅝ x 11 ⅝ x ½ in. (21.9 x 29.5 x 1.3 cm) book. Alfred and Marie Greisinger Collection, Walker Art Center, T. B. Walker Acquisition Fund, 1992, 1992.385. ©2015 Estate of Joseph Beuys/Artists Rights Society (ARS), New York. 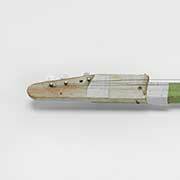 Joseph Beuys, Intuition, 1968, wood, graphite, nails; unlimited edition, 11 ⅞ x 8 5/16 x 2 ¼ (30.2 x 21.1 x 5.8 cm). Alfred and Marie Greisinger Collection, Walker Art Center, T. B. Walker Acquisition Fund, 1992, 1992.212. ©2015 Estate of Joseph Beuys/Artists Rights Society (ARS), New York. Inspired by the success of the paperback pocket book in the 1950s, Feelisch aimed to educate and change the patterns of everyday life; proliferation and dispersion were key.35 Beuys’s unlimited edition for Feelisch titled Intuition (1968), originally announced as Intuition … statt Kochbuch (Intuition … Instead of a Cookbook), is a plain wooden box held together by staples or nails and marked in pencil with the word of the title.36 Both simple and utilitarian, Beuys’s multiple quickly became Feelisch’s bestseller. Joseph Beuys, Fondazione per la rinascita dell'agricoltura, 1978, screenprint on paper, ink stamp; ed. AP 7/20, 36 ⅞ x 25 in. (93.6 x 63.5 cm). Alfred and Marie Greisinger Collection, Walker Art Center, T. B. Walker Acquisition Fund, 1992, 1992.456.1. ©2015 Estate of Joseph Beuys/Artists Rights Society (ARS), New York. Joseph Beuys, Fondazione per la rinascita dell'agricoltura, 1978, screenprint on paper, ink stamp; ed. AP 7/20, 24 15/16 x 36 11/16 in. (63.3 x 93.2 cm). Alfred and Marie Greisinger Collection, Walker Art Center, T. B. Walker Acquisition Fund, 1992, 1992.456.2. ©2015 Estate of Joseph Beuys/Artists Rights Society (ARS), New York. 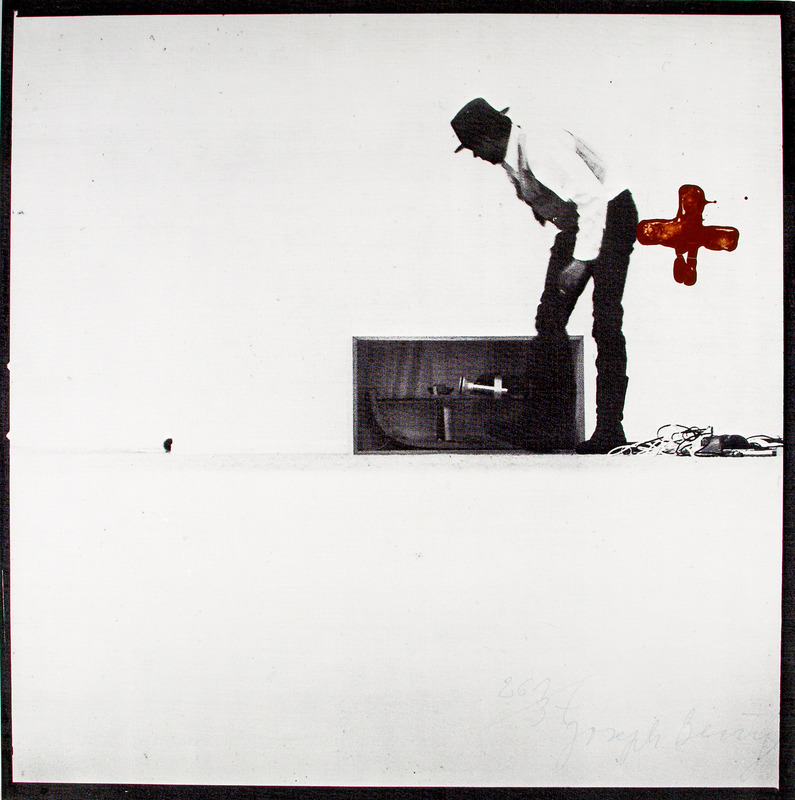 Joseph Beuys, Beuys boxt für direkte Demokratie (Beuys Boxes for Direct Democracy), 1972, offset lithograph on paper; ed. 53/100, 48 x 24 ⅞ in. (121.9 x 63.2 cm). Alfred and Marie Greisinger Collection, Walker Art Center, T. B. Walker Acquisition Fund, 1992, 1992.491. ©2015 Estate of Joseph Beuys/Artists Rights Society (ARS), New York. 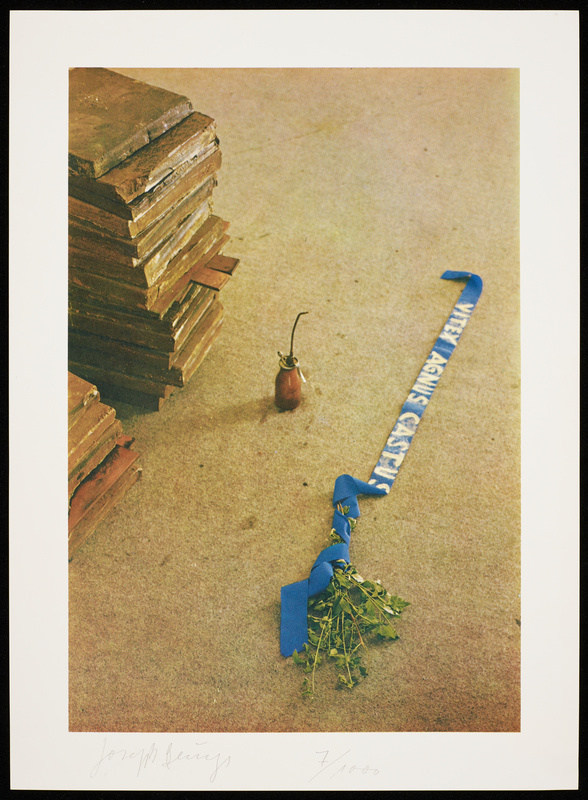 Joseph Beuys, ohne die Rose tun wir’s nicht (We Won’t Do It without the Rose), 1972, offset lithograph on paper, ink; ed. 7/80, 31 ¾ x 22 ¼ in. (80.7 x 56.6 cm). Alfred and Marie Greisinger Collection, Walker Art Center, T. B. Walker Acquisition Fund, 1992, 1992.481. ©2015 Estate of Joseph Beuys/Artists Rights Society (ARS), New York. 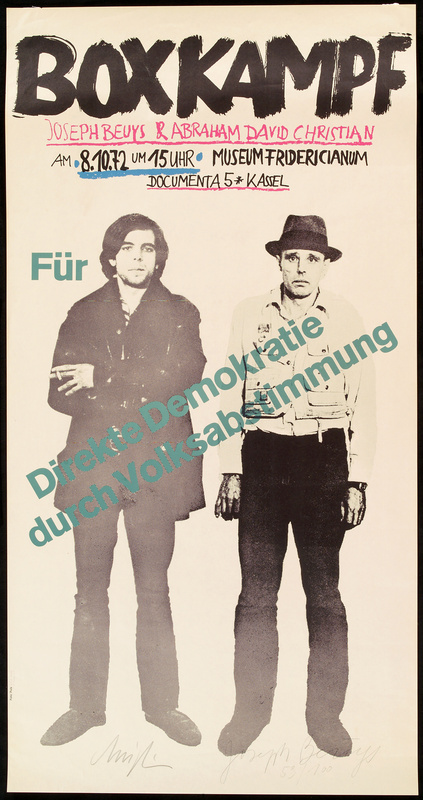 Joseph Beuys, So kann die Parteiendiktatur überwunden werden (How the Dictatorship of the Parties Can Be Overcome), 1971, printed polythene bag, felt, offset lithograph on paper; edition of 1,000, 30 ¼ x 20 ¼ in. (76.8 x 51.4 cm) bag. Alfred and Marie Greisinger Collection, Walker Art Center, T. B. Walker Acquisition Fund, 1992, 1992.432.1-.8. ©2015 Estate of Joseph Beuys/Artists Rights Society (ARS), New York. 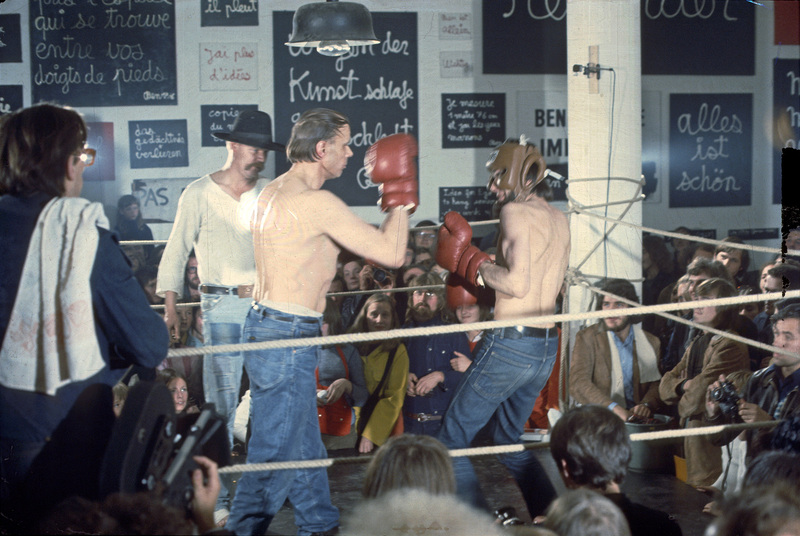 Joseph Beuy, Boxkampf für direkte Demokratie (Boxing Match for Direct Democracy), performed at documenta 5, Museum Fridericianum, Kassel, Germany, 1972. Image: documenta Archiv Stadt Kassel. ©2015 Estate of Joseph Beuys/Artists Rights Society (ARS), New York. Joseph Beuys, Demokratie ist lustig (Democracy is Merry), 1973, offset lithograph on paper; unlimited edition, 4 ⅛ x 5 ⅞ in. (10.5 x 15 cm). Alfred and Marie Greisinger Collection, Walker Art Center, T. B. Walker Acquisition Fund, 1992, 1992.322. ©2015 Estate of Joseph Beuys/Artists Rights Society (ARS), New York. 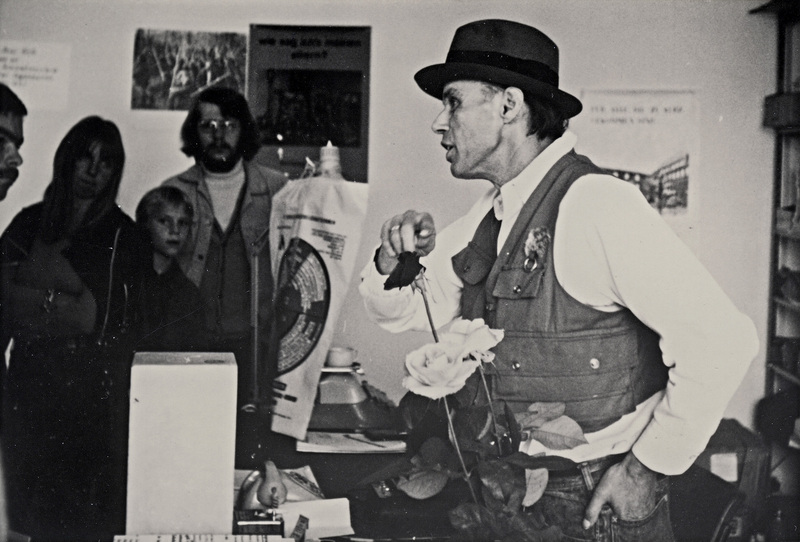 Instead of democratizing art through multiples—as the early advocates of multiple art had encouraged—Beuys used his multiples to advocate for participatory democracy. Joseph Beuy, Büro der Organisation für direkte Demokratie durch Volksabstimmung, documenta 5, Museum Fridericianum, Kassel, Germany, 1972. Image: documenta Archiv Stadt Kassel. ©2015 Estate of Joseph Beuys/Artists Rights Society (ARS), New York. Beuys’s multiple So kann die Parteiendiktatur überwunden werden (How the Dictatorship of the Parties Can Be Overcome) (1971), a printed polythene carrier bag containing a piece of felt and sheets of printed text, is a good example of his politically-engaged editions. This work became a key source of information concerning the ambitions of the Organization of Non-Voters for a Free Referendum. Distributed at no cost at Eine Straßenaktion (A Street Action) (1971) in Cologne, and sold in Kassel at documenta 5 in 1972 where the artist set up a “political bureau” as his contribution to the exhibition, this multiple informed the audience about the organization’s agenda and acted as a reminder of Beuys’s larger cause.47 Likewise, the calibrated glass cylinder Rose für direkte Demokratie (Rose for Direct Democracy) (1973) reproduced the vase from the desk where Beuys held meetings and discussions with documenta visitors. While the original vase contained a freshly cut red rose each day, the multiplied version stands in as a reminder of those earlier dialogues. Various multiples were realized in relation to activities by different branches of the FIU. Often these were published by Staeck, an artist, publisher, and political activist who had become one of Beuys’s travel companions by the mid-1970s. In these increasingly dispersed modes of production and distribution, the multiples provide evidence of the artist’s active and public engagement with sociopolitical debates in the increasingly politicized context of the Federal Republic of Germany. Instead of democratizing art through multiples—as the early advocates of multiple art had encouraged—Beuys used his multiples to advocate for participatory democracy. 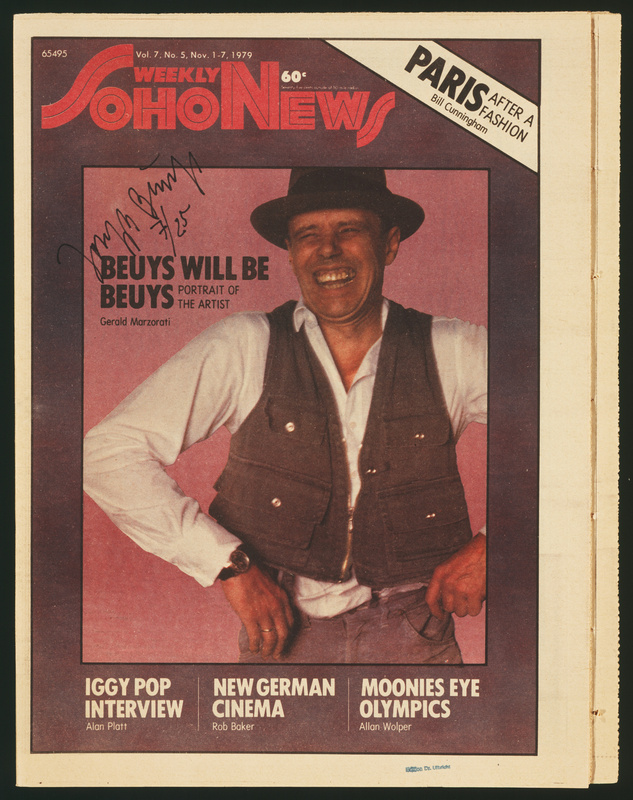 Joseph Beuys, Soho News, 1980, original newspaper Soho News with handwritten additions; ed. 7/25, 15 ⅛ x 11 ½ in. (38.4 x 29.2 cm). Alfred and Marie Greisinger Collection, Walker Art Center, T. B. Walker Acquisition Fund, 1992, 1992.254. ©2015 Estate of Joseph Beuys/Artists Rights Society (ARS), New York. Joseph Beuys, Cosmos und Damian 3-D (Cosmos and Damian 3-D), 1974, 3-D postcard with plastic coating, ink; unlimited edition, 6 ½ x 4 ¾ in. (16.5 x 12.1 cm). Alfred and Marie Greisinger Collection, Walker Art Center, T. B. Walker Acquisition Fund, 1992, 1992.335. ©2015 Estate of Joseph Beuys/Artists Rights Society (ARS), New York. Joseph Beuys, Ich versuche Dich freizulassen (machen) (I Am Trying to Set [Make] You Free), 1977, admission ticket, stamped; ed. 7/14, 1 ⅞ x 4 ¼ in. (4.8 x 10.9 cm). Alfred and Marie Greisinger Collection, Walker Art Center, T. B. Walker Acquisition Fund, 1992, 1992.305. ©2015 Estate of Joseph Beuys/Artists Rights Society (ARS), New York. 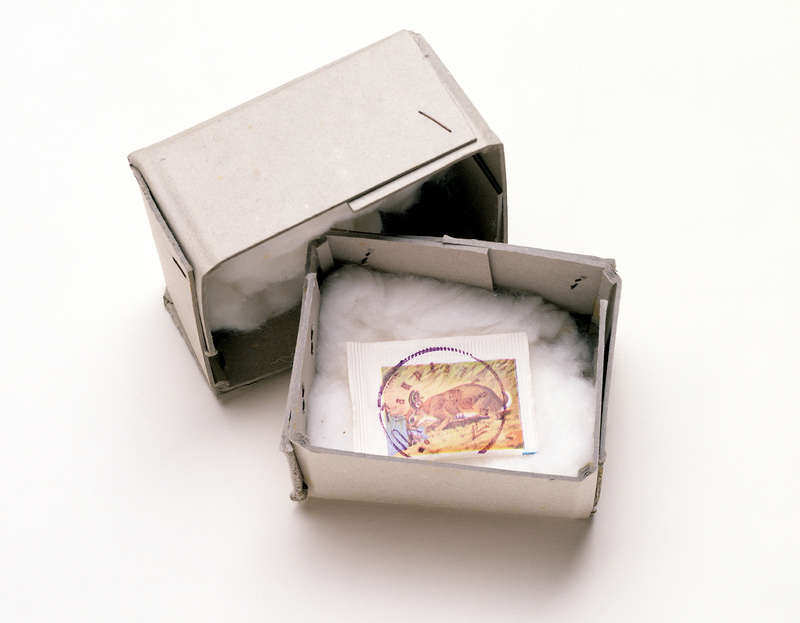 Joseph Beuys, Amerikanischer Hasenzucker (American Hare Sugar), 1974, offset lithograph on paper, packet of sugar, cotton wool, cardboard box, ink stamps; ed. 7/40, 1 3/16 x 2 7/16 x 1/16 in. (3 x 6.2 x 0.2 cm) sugar packet. Alfred and Marie Greisinger Collection, Walker Art Center, T. B. Walker Acquisition Fund, 1992, 1992.206.1-.6. ©2015 Estate of Joseph Beuys/Artists Rights Society (ARS), New York. Page from Joseph Beuys Multiples, Edition Jörg Schellmann, 1972. Walker Art Center Library. 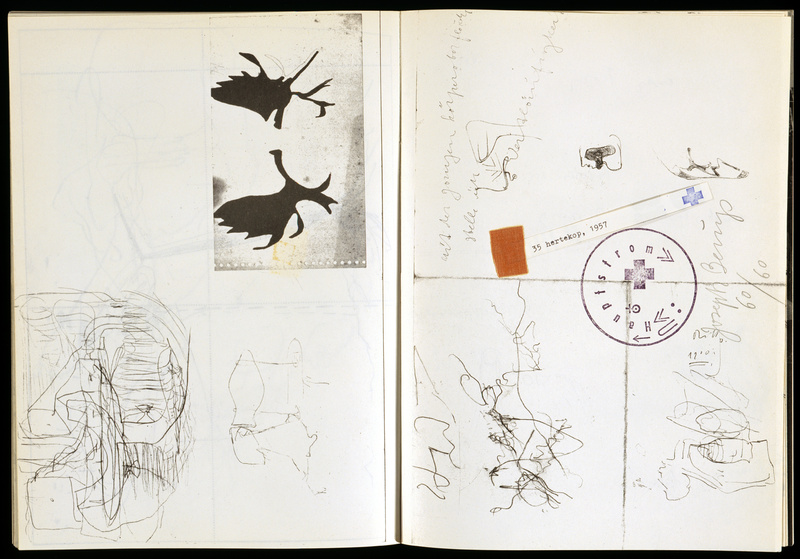 Page from Joseph Beuys Multiples II, Edition Jörg Schellmann, 1974. Rosemary Furtak Collection, Walker Art Center Library, Lib2000.230.1-.2. Despite the many functions they served—as carrier of political messages or “props for the memory”—it is important to remember that Beuys’s multiples were understood as artworks first and foremost. From the late 1960s onward, his works were staples of thematic group exhibitions that aimed to institutionalize the genre of multiplied art, present the form’s unfolding genealogy, and summarize its various approaches.48 Beuys’s multiples drew attention from the art market as well.49 The popularity of these works as collected objects is reflected in an article published in the March 1972 issue of the German weekly magazine Stern, the title of which asked, “Haben Sie auch schon einen hängen?” (Do you have yours hanging yet?). The article featured a number of collectors with their versions of Felt Suit—either worn or hanging in their wardrobe—and Sled, which was invariably pictured as a child’s toy. The feature provides strong evidence that Beuys and his multiples had become a part of both political discourse and consumer culture. Yet, despite their popularity, the multiples were considered too fragmentary, ephemeral, and disparate from the standard of the “original” artwork that was at the core of the collecting methodologies of twentieth-century Western art museums. It was publishers and private collectors—and notably not museums—who became pivotal for the production and preservation of these works. Writing in the early 1980s, Gerhard Storck, the late director of the art museums in Krefeld, reflected that it was private collectors who had actually collected these fragmentary works at the time of their production. While Storck believed that multiples were only able to reveal their complete, complex forms when seen in relationship to one another, museums wishing to display these works had to rely upon the holdings of private collectors to do so. Recalling a visit to the home of physician Rainer Speck, who, among others, had been a devoted collector of Beuys’s multiples (and had even published a few of them), Storck jealously described his desire to engage these works in a private environment, “after a meal for example, with clean fingers.”50 Despite their mass-produced quality, multiples by Beuys and other artists still attained a familiar, even intimate quality when placed in the homes and collections of individuals. While the multiple was promoted as readily attainable for all—hedging even on the territory of an impulse purchase—Beuys’s increasingly diverse output required the careful dedication of his more committed collectors. 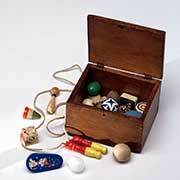 No longer conceived as one-off objects, the multiples became, for some, a serial affair. A preorder sheet for the second edition of the catalogue raisonné was integrated into the first, allowing the avid collector to keep up-to-date.51 On the one hand, this inclusion reaffirms Beuys’s commitment to the project of the multiples as of 1971; and on the other, it points to an enigmatic statement that the artist made, which was recalled by collector Günther Ulbricht in 1987 who remembers Beuys’s words: “If you have all my multiples, you have all of me.”52 More than fulfilling the wish to capture every aspect of his expansive practice in the form of manageably sized multiples, the order form also reads as a teaser for his collectors to “stay tuned,” and they did, some of them acquiring complete collections.53 The concept of dispersion—which was one of Beuys’s core motivations to design multiples—was thus tempered by the allure of accumulation. The category of the multiple reveals another element of Beuys’s working method as his expanding practice translated into frequent appearances in the public realm. With his lectures, discussions, and political demonstrations came an increasing amount of press coverage on television and, perhaps more importantly, in print. 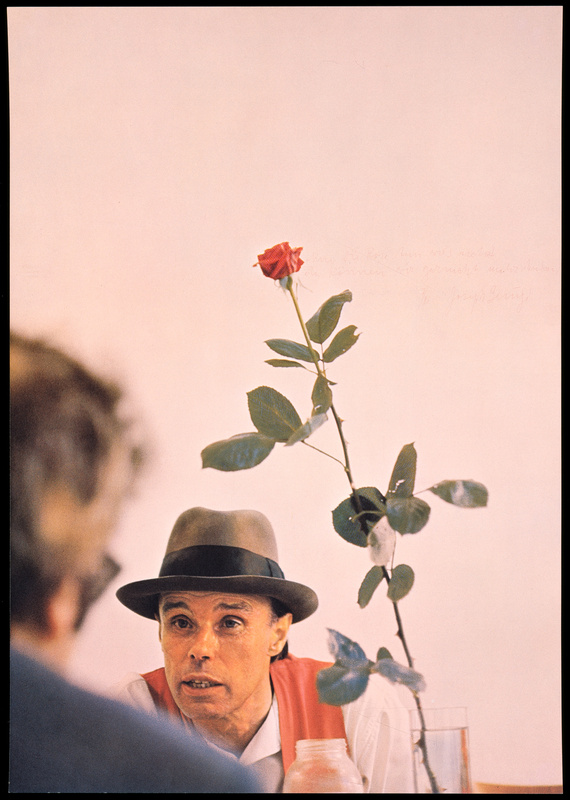 Designating a certain quantity of any given print-run as an edition, Beuys declared selected press clippings focusing on his art and persona as readymade multiples. Inverting the work of other artists, who proactively placed pieces among the advertisement pages of magazines and newspapers, he appropriated press articles and clippings written about him, in effect transforming mainstream media into his own multiplied art. Sometimes he used these materials unchanged from their original form, while at other times he altered them by adding his signature or a number of stamps.54 At once reflecting his public reception and documenting his activities, these multiples function as a discourse on Beuys’s work—“products of the artist’s working biography”—that the artist himself incorporated throughout his own practice.55 This act of “self-documentation,” which is a term borrowed from Barbara Rose who used it to describe Claes Oldenburg’s determination “to use every leftover,” becomes especially evident when looking at those multiples that are simply printed matter.56 These bits of ephemera included entry tickets, posters, and invitation cards—some designed by Beuys, but many made without his input—used as tools to announce a performance or an exhibition. 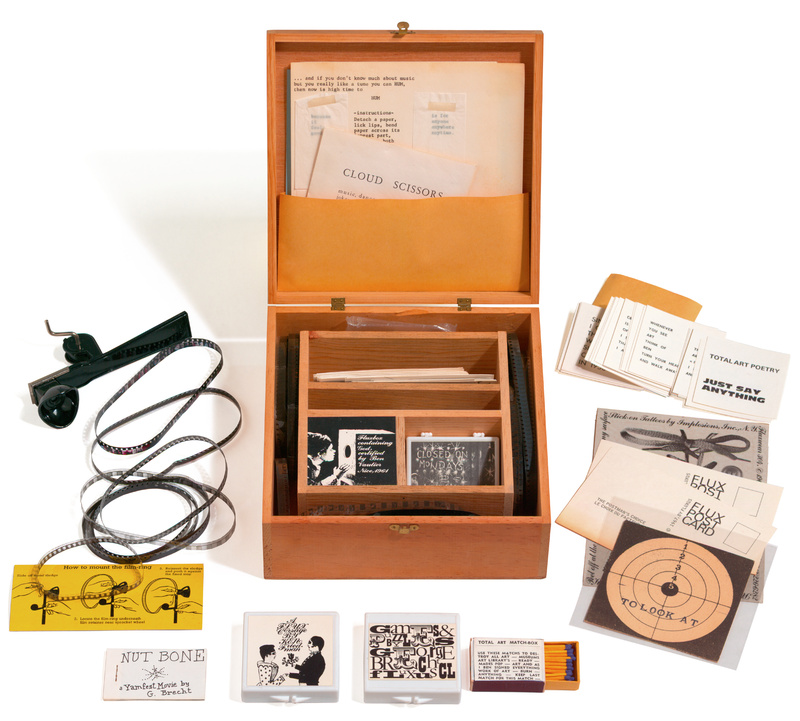 Reappropriated as multiples, these printed materials served to document Beuys’s art events and other moments, enacting a self-referential feedback loop. Audio recordings such as Schottische Symphonie/Requiem of Art (Scottish Symphony/Requiem of Art) (1973), coauthored with Danish musician and composer Henning Christiansen, are examples of multiples that approach documentation in a more conventional sense. These also fit in, to some extent, with the group of Beuys’s object-based multiples—mass-media objects being, per definition, a prototypical multiple. Due to his open-ended definition of the genre, the heterogeneity of Beuys’s multiples also reflects the collaborative nature of these works: in addition to publishers and collectors, “artists, writers, musicians, photographers, gallery owners, or political groups” frequently assumed the role of coauthor.59 The indexical information of the multiples, which includes their edition size and publisher name, is reminiscent of their art-historical precursors—prints and casts. This systematization also corresponds to a push to assimilate the production of art with that of other goods customarily authenticated by a trademark sign or label. Beuys’s complete set of multiples, therefore, serves as evidence not only of his expansive artistic practice and his intensely lived working biography but also of the development of the genre. Beuys’s impulse toward self-referential documentation while also projecting that material outward as a form of communication with his audience is, of course, a trend seen elsewhere in conceptual art of the time. From 1968 until 1979, Japanese artist On Kawara consistently noted the date and time when he arose each morning on postcards each stamped with the phrase “I got up at” that he sent to selected recipients. Through this repetitive act, he assured himself of his own being, charged the calendar date with meaning, and also distributed responsibility for his work and its preservation among the recipients. Similarly, American artist James Lee Byars was known for sending stylized letters that served as professional communication while also existing as works in and of themselves.60 These are just two artistic practices, among many, to which Beuys’s concept of dispersion might be compared, though these artists’ differing approaches and interpretation of the relationship between art and life is a subject for another text entirely. It should be noted that self-documentation was not a strategy that Beuys limited to his multiples. Rather, similar to all of his materials, these self-historicizing documents became part of the translatable humus that fed a broad range of artistic works. The document Lebenslauf/Werklauf (Life Course/Work Course), provides a good example. 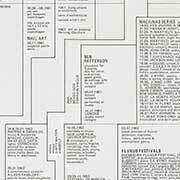 The piece, which first appeared as the artist’s contribution to the booklet for the Festival der Neuen Kunst (Festival for New Art) in 1964, appropriates the conventional format of an artist’s curriculum vitae, mixing biographical moments with fiction and professional history. The editing process for this work began in 1961 and continued to serve as a structural constituent of his exhibitions, establishing his characteristic practice of fusing life and work by introducing parallel narratives and rendering the different paths indistinguishable. The first English translation of this document became a part of his multiples practice through its appearance in I The Chief, II How To Explain Paintings to a Dead Hare (1970). In what “may be regarded as a kind of visual analogue to Life Course/Work Course, Beuys created the installation Arena—Dove sarei arrivato se fossi stato intelligente! (Arena—where would I have got if I had been intelligent!) (1970–1972).61 Consisting of one hundred frames that contain various photographs of performances and installations, Arena offers a summary of Beuys’s performative and sculptural work from the late 1940s to the early 1970s. Here again the artist appropriated his life’s work, reiterating it in a new expanded form. Similarly, the print Vitex Agnus Castus (1973) reconstitutes the visual record of Arena as an editioned object. Such works point to Beuys’s own biography as an elastic, constantly recycled, and complex component of his art across the wide range of production. Different bits and fragments of biographic material become tangible through such multiplied forms brought into circulation along with the artist’s ideas. Across decades of production, Beuys created his very own definition of the multiple. By the 1970s, his version of the genre had come to exist as an open category and had become his constant companion. For Beuys, the structural nature of the multiple guaranteed continuous dispersion and multiplication of his ideas, while at the same time offering a cumulative overview and record of his public life and work. His impulse to maintain the connection between early and later work, to suspend and maintain the ongoing dialogue evinced by his practice, becomes especially tangible through his multiples. The many layers of Beuys’s continuous method of self-referencing are encapsulated in a screenprinted image that appears in a version of his multiple 3 Tonnen-Edition (3 Ton Edition) (1973–1985). Here, the artist is seen reinstalling one of his sleds from The Pack, and nearby rests a shipping crate used for its transport to Stockholm’s Moderna Museet in 1971. This photograph by Lothar Wolleh documents Beuys releasing his work into the public sphere yet again—this time into the sphere of the museum—and positions the work of reinstalling and recontextualizing as an integral part of the artist’s practice. Joseph Beuys, Vitex agnus castus, 1973, offset lithograph on paper; ed. 7/1,000, 23 ⅞ x 17 ⅜ in. (60.6 x 44.1 cm). Collection, Walker Art Center, T. B. Walker Acquisition Fund, 1992, 1992.437. ©2015 Estate of Joseph Beuys/Artists Rights Society (ARS), New York. Joseph Beuys, 3 Tonnen-Edition (3 Ton Edition), 1973-1985, screen print printed in black ink on vinyl, oil paint, 18 ⅛ x 17 15/16 in. (46 x 45.5 cm). Harvard Art Museums/Busch-Reisinger Museum, The Willy and Charlotte Reber Collection, Louise Haskell Daly Fund, 1995.274.12. ©2015 Estate of Joseph Beuys/Artists Rights Society (ARS), New York. Maja Wismer is a PhD candidate at the University of Basel, where she is writing a dissertation on the multiples of Joseph Beuys, situating them in their 1960s and 1970s West German context of production and reception. After studies in Basel and Berlin, she received her MA in art history in 2009 from the University of Basel. She has since worked at an international level on a variety of exhibitions and publication projects within the field of contemporary art. Project venues include, among others, the Pinakothek der Moderne, Munich; the Royal Institute of Art, Stockholm; and the Latvian Center for Contemporary Art, Riga. Beginning with her MA thesis on The Uncanny by Mike Kelley, her exhibition work and academic research have consistently explored how exhibitions and publications unfold as forms and translate into the public sphere. Research for this article was made possible by Wismer’s position as Renke B. and Pamela M. Thye Curatorial Fellow in the Busch-Reisinger Museum, Harvard Art Museums, from 2012 through 2014. See Günter Herzog, “René Block im Gespräch mit Günter Herzog, 25. 11. 2008,” in Joseph Beuys: Wir betreten den Kunstmarkt, ed. Zentralarchiv des internationalen Kunsthandels (Nuremberg: Verlag für moderne Kunst, 2009), 9. The original cost of The Pack adjusted to today’s monetary values would equal approximately US $160,000. See, for example, Adam C. Oellers, “Fluxus +- RWTH Aachen!? Technikstudenten erleben vier Jahre lang ein höchst erstaundliches Kulturprogramm,” in Nie wieder störungsfrei! Aachen Avantgarde seit 1964, ed. Brigitte Franzen et al. (Bielefeld: Kerber, 2011), 22–39. Helge Drafz, “Argumentation, Aktion, Agitation—Joseph Beuys in Fersehberichten,” unpublished lecture at K20 Kunstsammlung Nordrhein-Westfalen, Schmela Haus, Düsseldorf, Germany, February 25, 2010. Dieter Koepplin, Joseph Beuys in Basel, Bd. 3, Schneefall (Munich: Schirmer/Mosel Verlag, 2012), 10. The cost of Beuys’s installation sold at the 1969 art fair in Cologne was equivalent at the time to the selling price of works by American artists such as Robert Rauschenberg and Andy Warhol. See Herzog, “René Block im Gespräch mit Günter Herzog,” 9 and 16. Ibid., 19. According to the sales catalogue of Edition Block, Sled was originally offered for DM 330 and was already sold out by 1971. See “Preisliste gültig ab 1.3.1971 bis 28.2.1972,” in Editionen der Galerie René Block Berlin, ed. Edition René Block (Berlin: Edition René Block, 1971), unpaginated. Beuys’s performance I Like America and America Likes Me marked the inauguration of Gallery Block’s venue in New York City’s SoHo neighborhood in May 1974. For an account of the performance, see Uwe M. Schneede, Joseph Beuys, Die Aktionen (Ostfildern-Ruit: Verlag Gerd Hatje, 1994), 330–353. See Herzog, “René Block im Gespräch mit Günter Herzog,” 19. René Block, “Bemerkungen zu Anliegen, Aufbau und Auswahl der Ausstellung,” in Multiples: Ein Versuch die Entwicklung des Auflagenobjektes darzustellen / Multiples: An Attempt to Present the Development of the Object Edition, ed. René Block (Berlin: NBK, 1974), 10–11. See also Herzog, “René Block im Gespräch mit Günter Herzog,” 19. Joseph Beuys: The Multiples, Catalogue Raisonné of Multiples and Prints, 8th ed., ed. Jörg Schellmann (New York/Munich: Edition Schellmann, 1997). Beuys’s story was republished in Joseph Beuys im Lenbachhaus und Schenkung Lothar Schirmer, ed. Helmut Friedel and Lothar Schirmer (Munich: Schirmer/Mosel, 2013), 118–119. In addition to the stag, a number of other animals are featured throughout Beuys’s work. Introduced through his early drawings, they became recurring motifs, each attached with certain roles and characteristics. For example, the stag can be interpreted as a spiritual leader, while the notion of healing in this tale anticipates the artist’s practice of leveraging art toward social change, which began in the 1970s. For more on Beuys’s animal motifs, see Ann Temkin, “Life Drawing,” in Thinking Is Form: The Drawings of Joseph Beuys, ed. 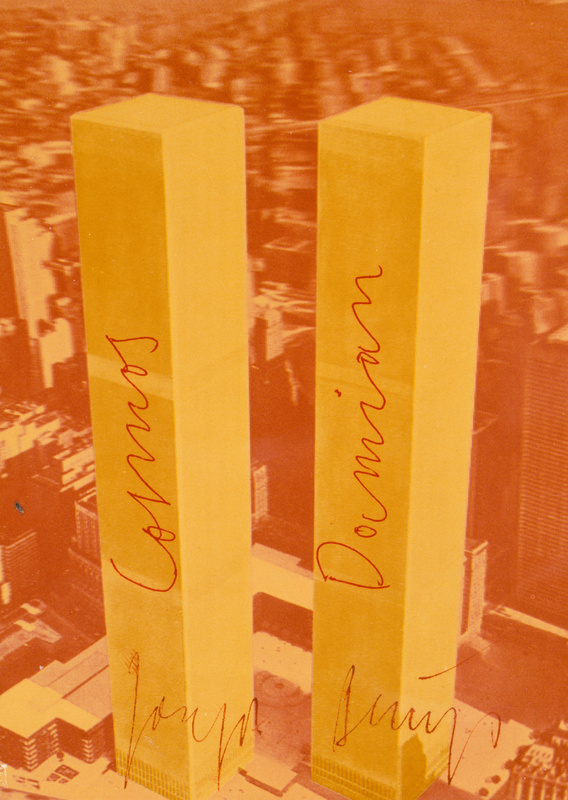 Ann Temkin and Bernice Rose (New York: Thames & Hudson, 1993), 33–34. Kirsten Voigt, ed., “Ich bin interessiert an Transformation, Veränderung, Revolution,” in Joseph Beuys: Zeichnungen (Karlsruhe: Staatliche Kunsthalle, 2006), 47. Gene Ray, “Joseph Beuys and the After-Auschwitz Sublime,” in Joseph Beuys: Mapping the Legacy, ed. Gene Ray (New York: D.A.P./Ringling Museum, 2001), 55–74. The mythologized narrative of Beuys’s rescue as well as his material choices used throughout his practice, grey felt being chief among them, have evoked multiple discussions about the artist and his anxiety relating to the crimes of Nazi Germany. As Ray’s essay elaborates, there are several works that involve an intense consideration of Germany’s recent past and its impact on German society. Beuys’s thorough involvement with pedagogy, everyday politics, and the functioning of democracy as of the late 1960s illuminates his impulse to “cure” and better society going forward. For a further account and contextualization of Beuys’s rescue story, see Peter Nisbet, “Crash Course: Remarks on a Beuys Story,” in Ray, Joseph Beuys: Mapping the Legacy, 5–17. Julia Robinson, “Multiple Manifestations: Nouveau Réalisme & Fluxus,” in The Small Utopia: Ars Multiplicata, ed. Germano Celant (Milano: Fondazione Prada, 2012), 136. For an introduction to Spoerri’s publication projects, see Katerina Vatsella, Edition MAT: die Entstehung einer Kunstform: Daniel Spoerri, Karl Gerstner und das Multiple (Bremen: Hauschild, 1998). Owen F. Smith, “Fluxus: A Brief History and Other Fictions,” in In the Spirit of Fluxus, ed. Elizabeth Armstrong and Joan Rothfuss (Minneapolis: Walker Art Center, 1993), 24. Marian Goodman and John Loring, “To Create is Divine, To Multiply is Human,” in Block, Multiples: An Attempt to Present the Development of the Object Edition, 29. For examples, see Smith, “Fluxus: A Brief History and Other Fictions,” 22–37. Rolf Ricke in conversation with Kerstin Skrobanek, “Galerie Rolf Ricke. Pop-Art und weiße Schokolade. Wie die amerikanischen Pop-Art-Multiples nach Deutschland kamen,” in Gut aufgelegt: die Sammlung Heinz Beck, ed. Nina Schallenberg and Kerstin Skrobanek (Cologne: Wienand, 2013), 145. Peter Schmieder, Unlimitiert. Der VICE-Versand von Wolfgang Feelisch. Unlimitierte Multiples in Deutschland. Kommentiertes Editionsverzeichnis der Multiples von 1967 bis in die Gegenwart (Cologne: Buchhandlung Walther König, 1998), 53. The exhibition Ars Multiplicata, presented at the Wallraf-Richartz-Museum in Cologne in 1968, focused exclusively on multiplied art. In 1971, serial art seems to have dominated the Basel Art Fair; see Christian Herchenröder, “Serielle Kunst dominiert in Basel,” Handelsblatt 119, June 25/26, 1971. By 1972, a journalist covering the multiples-focused Berlin fair, Internationale Frühjahrsmesse, noted that the genre was by then well established; see Lucie Schauer, “Die Macht der Multiples: 64 Aussteller auf der Internationalen Kunstmesse in Berlin,” Die Welt, April 28, 1972, 99. On this topic, see also Christine Mehring, “Emerging Market: On the Birth of the Contemporary Art Fair,” Artforum International 46, no. 8 (April 2008): 322–329, 390. The thirty-minute long feature was produced for West Deutscher Rundfunk to coincide with the second Cologne art fair in 1968. The program, coauthored by Schum, artist Bernhard Höke, and art historian Hannah Weitemeier, originally aired on October 17, 1968. From 1969 to 1970, Schum pursued the rather progressive project of operating a television gallery, for which Beuys made Filz-TV (Felt TV) (1970). For more on Schum and the documentary, see Barbara Hess, “Abendschau: Drei Filme über Kunst,” in Ready to Shoot: Fernsehgalerie Gerry Schum, Videogalerie Schum, ed. Ulrike Gross, Barbara Hess, and Ursula Wevers (Cologne: Snoeck, 2003), 15. Heubach, quoted in Ian White, “Who is Not the Author? Gerry Schum and the Established Order,” in Afterthought: New Writing on Conceptual Art, ed. Mike Sperlinger (London: Rachmaninoff’s, 2005), 66. The film prominently featured journalist Willi Bongard, who in 1970 introduced Kunstkompass to the magazine Capital: “The yearly survey ranked artists according to reputation and was based on a point system that calculated representation in important museum collections, international exhibitions, and art literature.” Mehring, “Emerging Market,” 390. The film also features Karl Gerstner, an advertising man, designer, and copublisher of Edition MAT as of 1964. Bongard and Gerstner both talk about their agenda for the transformation of the art market through bringing in new ideas and customers. On Gerstner, see Vatsella, Edition MAT: die Entstehung einer Kunstform, 79–80. By the early 1960s, a number of artists had already begun criticizing contemporary society’s single-minded focus on consumption. The 1962 performance Demonstration for Capitalist Realism, enacted by artists Gerhard Richter and Konrad Lueg at the Möbelhaus Berges, Düsseldorf, has become canonical in this regard. For more on this topic, see Andrew S. Weiner, “Memory under Reconstruction: Politics and Event in Wirtschaftswunder West Germany,” Grey Room 37 (Fall 2009): 95–124; and the comprehensive catalogue Living with Pop: A Reproduction of Capitalist Realism, ed. Kunsthalle Düsseldorf (Cologne: Buchhandlung Walther König, 2013). See Herzog, “René Block im Gespräch mit Günter Herzog,” 18. “Theory of Sculpture,” the commonly used translation in Beuys scholarship for the artist’s original wording, “Plastiche Theorie,” doesn’t fully capture the term’s meaning, which ties more to shaping or modeling, in general, rather than directly to the genre of sculpture as such. On Beuys’s “Theory of Sculpture,” see Theodora Vischer, Joseph Beuys. Die Einheit des Werkes. Zeichnungen, Aktionen, Plastische Arbeiten, Soziale Skulptur (Köln: Buchhandlung Walther König, 1991), 39–42. 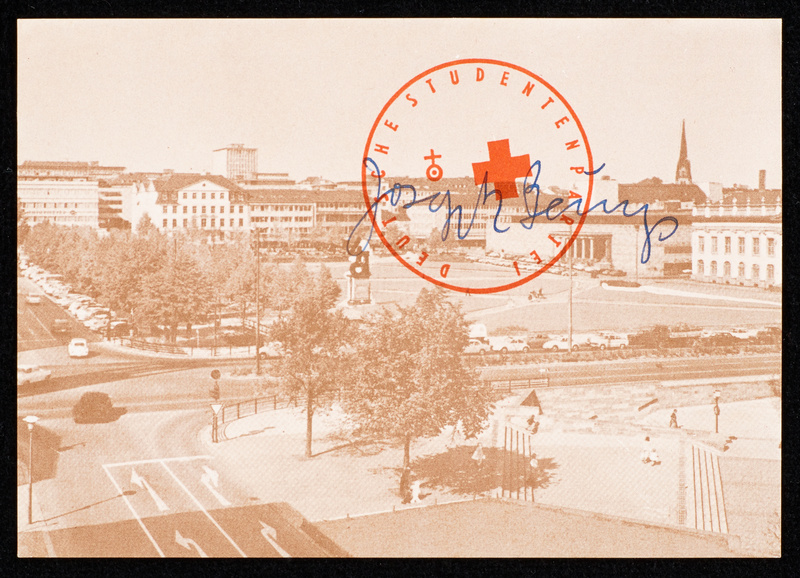 Beuys and Staeck published more than 100 postcards together, among them a series of five special cards that employed Beuys’s signature materials of felt, wood, and sulphur. See, for example, “Klaus Staeck im Gespräch mit Heinz Holtmann 20.1.2009,” in Joseph Beuys: Wir betreten den Kunstmarkt, ed. Zentralarchiv des internationalen Kunsthandels (Nuremberg: Verlag für Moderne Kunst, 2009), 61. The dynamic relationship between sender and receiver was in fact a frequent topic in Beuys’s work as is apparent, for example, in the performance Der Chef (The Chief) (1964); or in the titling of the multiple Telephon S―Ǝ (Telephone T―Я) (1974) where the “S” stands in for Sender and the “E” for Empfänger (“T” for “transmitter” and “R” for “receiver”). 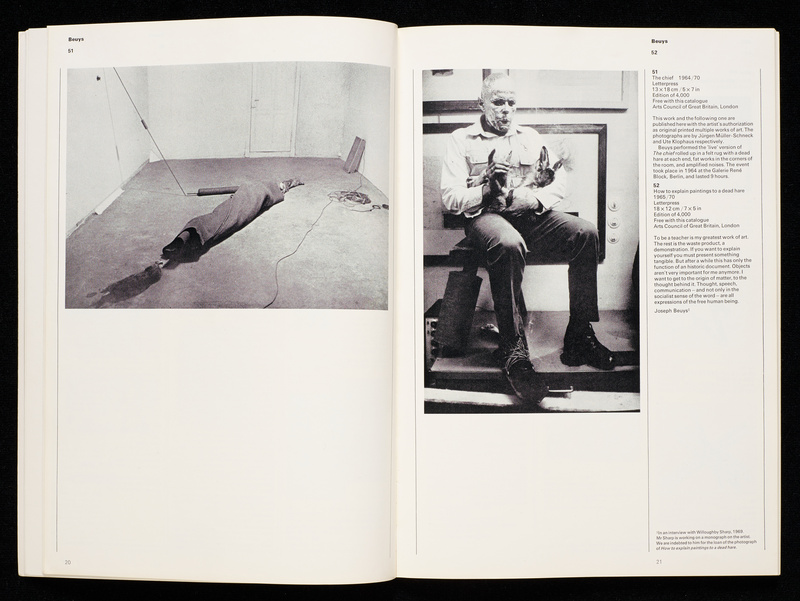 For an account of Beuys’s performance, see Schneede, Joseph Beuys, Die Aktionen, 68–79. According to the publisher, none of Beuys’s multiples published with Block were supposed to be signed. See the commentary acccompanying the multiple In Memoriam George Maciunas (1978–1982) made by Beuys and Nam June Paik on the website of Edition Block, accessed July 7, 2014, http://www.editionblock.de/mappenarbeitde.php?aid=42. Beuys’s performance The Silence of Marcel Duchamp Is Overrated (1964) is the most obvious support of the artist’s position. For a recount of the performance, see Schneede, Joseph Beuys, Die Aktionen, 80–83. See also Joan Rothfuss, “Echoes in America,” in Joseph Beuys: Mapping the Legacy, ed. Gene Ray (New York: D.A.P./Distributed Art Publishers, Inc., 2001), 42. Herzog, “René Block im Gespräch mit Günter Herzog,” 13. By 1969, the cost of the editions had raised to DM 12, and soon after to DM 15 to adjust for increasing shipping costs. Schmieder, Unlimitiert. Der VICE-Versand von Wolfgang Feelisch, 48. Schellmann, Joseph Beuys: The Multiples, 9. Schmieder, Unlimitiert. Der VICE-Versand von Wolfgang Feelisch, 29. See VICE-Versand’s sales brochure Zeitkunst für den Haushalt, ed. Wolfgang Feelisch (Remscheid: VICE-Versand, 1968). See also Jörg Schellmann and Bernd Klüser, eds., Joseph Beuys: Multiples, 1st ed. (Munich: Verlag Schellmann und Klüser, 1971). The German Student Party was later renamed in Fluxus Zone West. 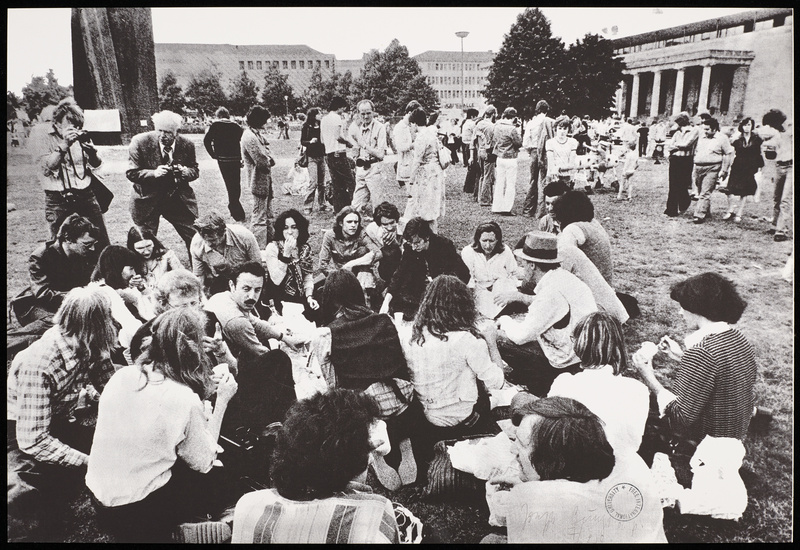 See Susanne Anna, ed., Joseph Beuys, Düsseldorf (Ostfildern: Hatje Cantz, 2008), 64–65, 77; and Caroline Tisdall, “Permanent Conference: Beuys as Teacher,” in Joseph Beuys (New York: Solomon R. Guggenheim Museum, 1979), 265–266. 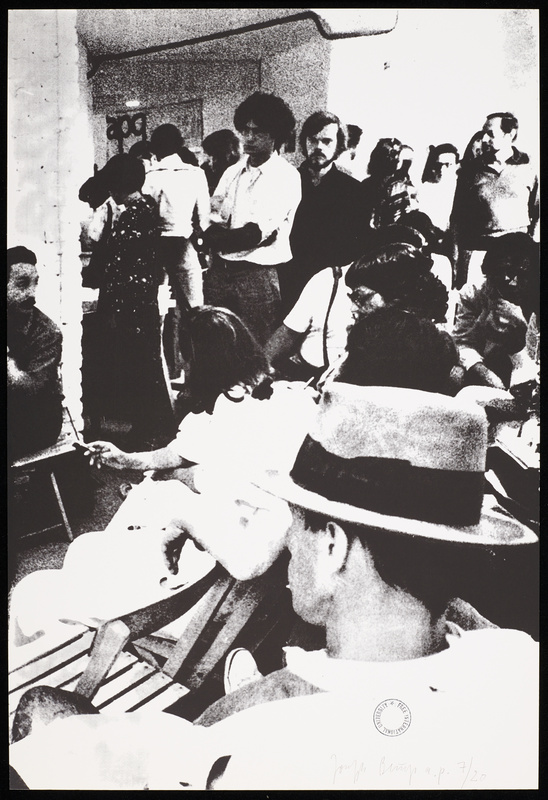 On the founding of the Organization for Direct Democracy through Referendum, see Götz Adriani, Winfried Konnertz, and Karin Thomas, eds., Joseph Beuys: Life and Works (New York: Barron’s, 1979), 220–227; and Anna, Joseph Beuys, Düsseldorf, 91–99. Tisdall, “Permanent Conference, ” 268. On Steiner’s role for Beuys, see H. P. Riegel, Beuys: Die Biographie (Berlin: Aufbau Verlag, 2013), 100–110, 124–132. For a brief comment on Beuys’s references to Steiner, see Vischer, Joseph Beuys. Die Einheit des Werkes, 14 and 25. 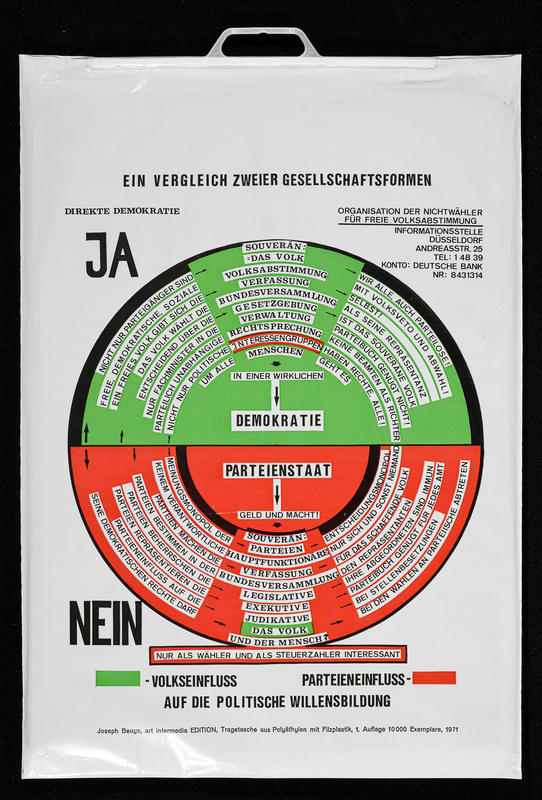 See Beuys’s political program for the Organization of Non-Voters in Tisdall, “Permanent Conference, ” 268–269. The decision to dismiss Beuys from his post prompted a number of letters of support from a group of international artists including Allan Kaprow, Panamarenko, and Marcel Broodthaers. See Adriani et al., Joseph Beuys: Life and Works, 258–260. 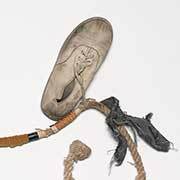 For a detailed account of the negotiations, see Anna, Joseph Beuys, Düsseldorf, 68–145. Anna, Joseph Beuys, Düsseldorf, 103; and Riegel, Beuys: Die Biographie, 392. Together with the committee member and Nobel Prize–winning writer Heinrich Böll, Beuys wrote a manifesto for the FIU’s mission, later also published in Tisdall, “Permanent Conference, ” 278–279. Branches of the FIU were active in Düsseldorf, Achberg, Hamburg, Kassel, and Pescara. 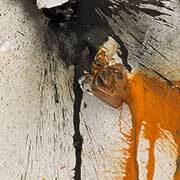 See Anna, Joseph Beuys, Düsseldorf, 150–163; and Tisdall, “Permanent Conference, ” 282. A series of multiples relating to projects initiated by Lucrezia De Domizio Durini, for example, was sometimes intended to raise funds for the realization of the projects. See, for example, Ilaria Apostoli, “Bolognano: Zufluchtsort für eine Utopie der Kunst,” in Beuys Voice, ed. Lucrezia de Domizio Durini (Milan: Electa, 2011), 374–382. See Schneede, Joseph Beuys, Die Aktionen, 381; and Adriani et al., Joseph Beuys: Life and Works, 248. Bongard’s Kunstkompass (see endnote 21) frequently listed multiples by Beuys as of the early 1970s. Gerhard Storck, “Warhnehmung, Aneignung, Darstellung. Die Sammlung Reiner Speck,” in Gerhard Storck. Es besteht ein nicht erklärbarer Zusammenhang, ed. Julian Heynen (Cologne: Dumont, 2012), 252. See Schellmann and Klüser, Joseph Beuys: Multiples. 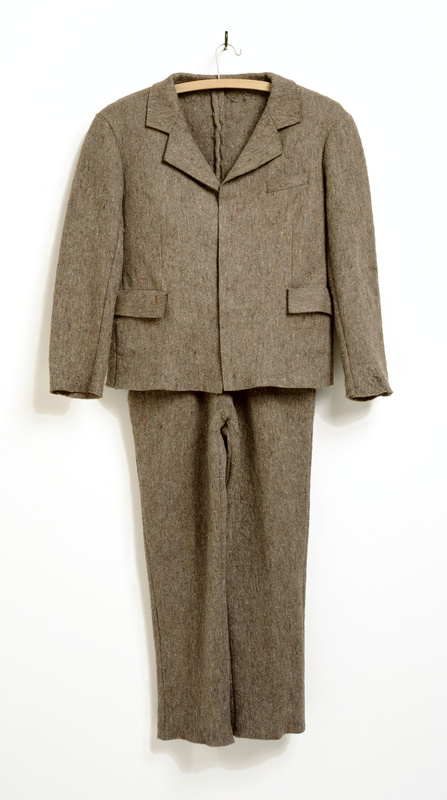 Katharina Schmidt, “Zur Beuys Stiftung Ulbricht im Kunstmuseum Bonn,” in Joseph Beuys, Die Multiples, (Bonn: Kunstmuseum, 1992), III. Günther Ulbricht’s nearly complete set of Beuys’s multiples is held today by the Kunstmuseum in Bonn, and contributed significantly to the circulation of this body of work through an expansive international exhibition tour in the late 1970s and early 1980s. Alfred and Marie Greisinger’s nearly complete set was on display for many years inside his pastry shop (first in Augsburg, and later in a new store in Baden-Baden) until it was acquired by the Walker Art Center in 1992. On the introduction and functioning of the different stamps that Beuys used in his work beginning in 1967, see Vischer, Joseph Beuys. Die Einheit des Werkes, 52–54. Schellmann, Joseph Beuys: The Multiples, 31. 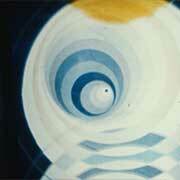 Barbara Rose, “The Origins, Life and Times of Ray Gun,” Artforum 8, no. 3 (November 1969): 50. For more on the creation of the multiple American Hare Sugar, see Joan Rothfuss, “Energy Plan for the Western Man,” Walker Art Center, accessed July 7, 2014, http://www.walkerart.org/archive/C/9C4315B360BFDC526167.htm. On the trip, see Rothfuss, “Energy Plan for the Western Man”; and Carin Kuoni, ed., Energy Plan for the Western Man: Joseph Beuys in America (New York: Four Walls Eight Windows, 1990). 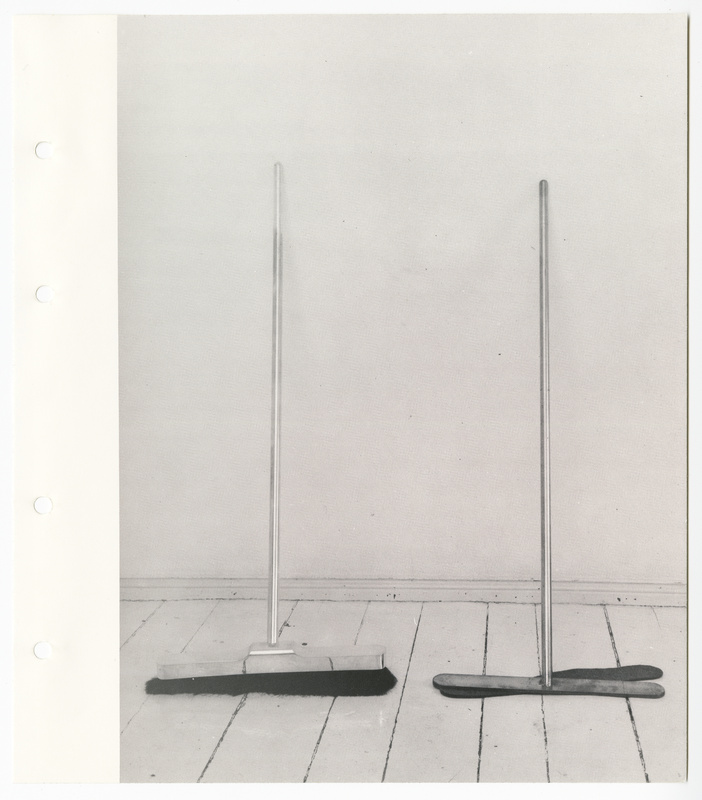 Schellmann, Joseph Beuys: The Multiples, 29–30. See James Lee Byars: Letters to Joseph Beuys, eds. Stiftung Museum Schloss Moyland, Sammlung van der Grinten, Joseph Beuys Archiv des Landes Nordrhein-Westfalen (Ostfildern: Hatje Cantz, 2000). Lynne Cooke, “An Introduction,” in Joseph Beuys: Arena—where would I have got if I had been intelligent!, ed. Lynne Cooke and Karen Kelly (New York: Dia Art Foundation, 1994), 12.